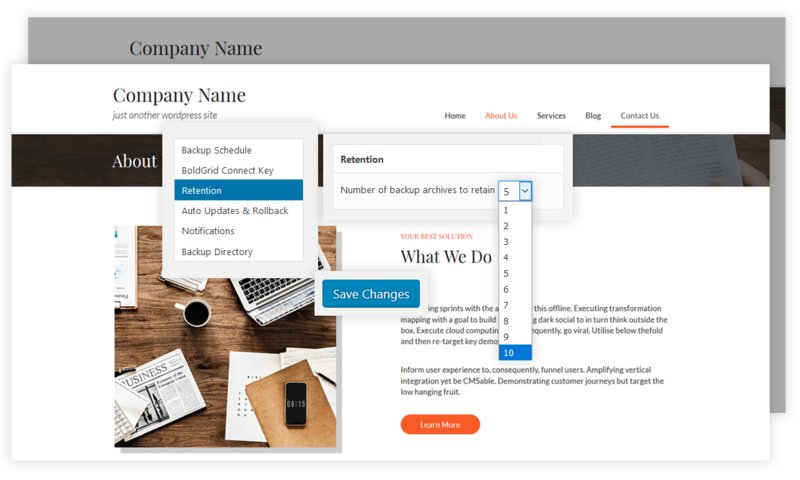 BoldGrid Backup is an automated backup, fault protection, and migration solution that allows you to secure, restore, or move your website with ease. Use BoldGrid Backup to quickly restore your site after server crashes, website hacks, rogue updates, and other threats. BoldGrid Backup allows one business unlimited use for JUST $60/year! Simply install BoldGrid Backup, select a date and time for automatic backups and you’re good to go! Download, restore, or delete backups with a single click. You can set BoldGrid Backup to automatically backup your site before updates, and automatically rollback your site to the last backup if an update fails. Automatic updates can be set for WordPress core, plugins, and themes individually. Do you have a file that needs to be restored, but not sure which backup it’s in? Historical Versions shows you a list of all of your backups containing that file, and offers an easy way to restore the file. 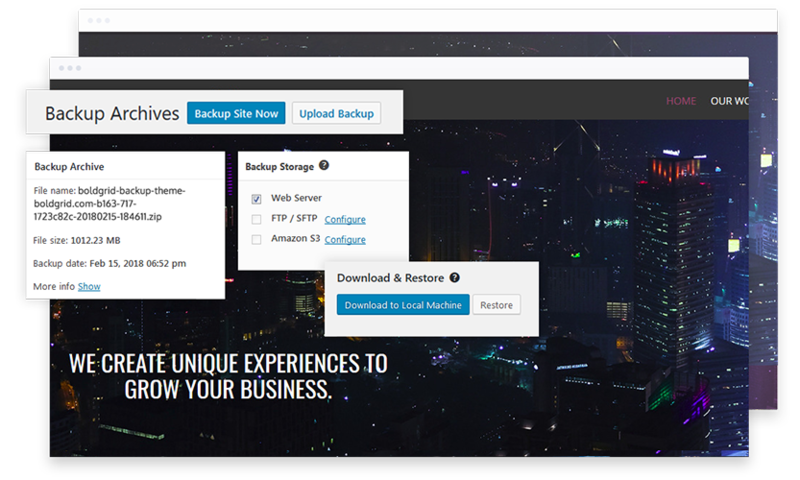 BoldGrid Backup Premium allows you to store your backup on Amazon S3 or Google Drive in addition to the free options of FTP / SFTP. For just $60/year, you can install BoldGrid Backup on as many sites as you need. Many other backup plugin providers forces you to pay for a new license for every site you wish to protect, or they’ll often employ confusing pricing schemes. BoldGrid Backup provides unlimited use for one business with one simple price. BoldGrid Backup Plugin will backup your ENTIRE WordPress site, including pages, posts, settings, and more — with just a few clicks! Simply select a date and time for automated backups, or manually create a backup at any time with a single click. Safely store backups remotely via Amazon S3, Google Drive, or FTP / SFTP. BoldGrid Backup checks to ensure your web hosting account offers necessary support, ensuring the integrity of your backups. You can also perform auto-backups before theme updates and auto-rollbacks in case an error occurs. Download, restore, or delete backups with a single click. You can even import your backup to restore in a new WordPress installation for easy migration. Use our restoration script to restore a backup from outside of WordPress in the event WordPress itself has been corrupted. BoldGrid Backup gives you control of automatic WordPress updates. Select whether to auto update for major, minor, development, and/or translation updates. You can even set Auto Backups to run before the update. Each plugin and theme can have auto updates enabled individually. Unlock the full potential of BoldGrid Backup by upgrading to BoldGrid Premium. Simply choose a date and time for automatic backups and you’re good to go! Download, restore, or delete backups with a single click. 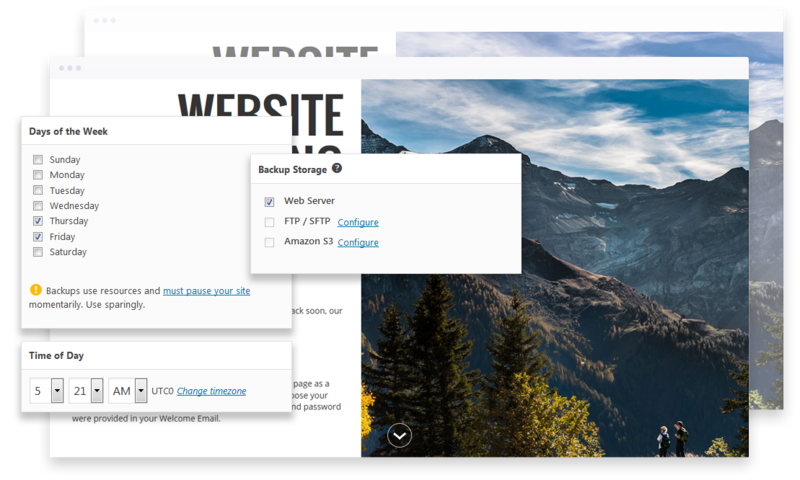 Install BoldGrid Backup on both WordPress sites, create a backup archive on the first site, then restore that backup on your second site. You have complete control over which files, folders, and database tables are included. You can include/exclude WordPress core files, content, plugins, themes, images, and more as needed. Create backups automatically before WordPress updates. Select whether to auto update for major updates, minor updates, development updates, and/or translation updates. 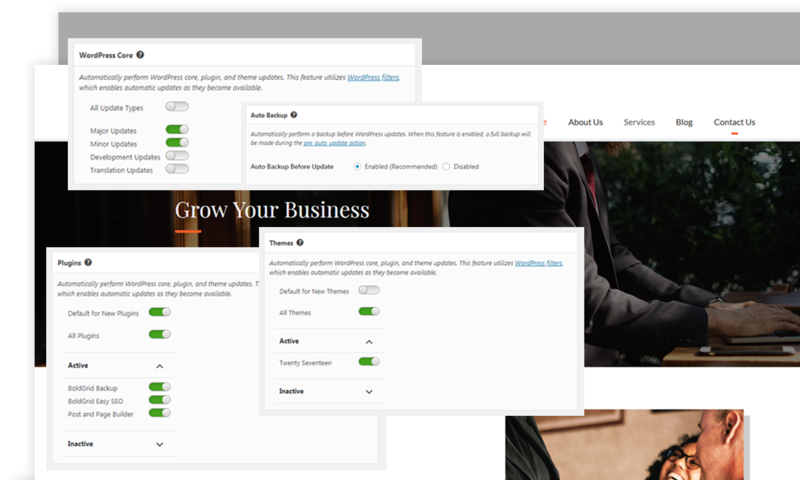 Select which of your plugins to have automatically updated when updates are available. Lists all of your backups containing a particular file and offers an easy way to select a backup to restore that file from. Saves a backup of any files modified by the WordPress Plugin Editor.. Allows you to search for all files modified within a certain time frame. You can easily find other versions of that file within your backups. Keeps a running log of significant actions to your WordPress site, including which users updated a plugin, theme, or WordPress itself. Easily organize your backups by label. When viewing the details of a backup, click the “Upload” button to easily upload the backup archive to one of your remote storage providers. Ensure the integrity of your backups with remote storage. With BoldGrid Premium, you can save backups at Amazon S3 / Google Drive / FTP / SFTP. Free users are restricted to FTP / SFTP. Specify a custom folder name for FTP uploads to keep your server organized. View a list of all of your backups and where each one is stored (Web Server or Offsite). View the files in a backup. View tables and number of records per table in a backup. Allows you to compare the database in a backup against your live website’s database. Restore only the database from a backup, but not any of the files. No disk space or database size limitations are imposed on your backups. 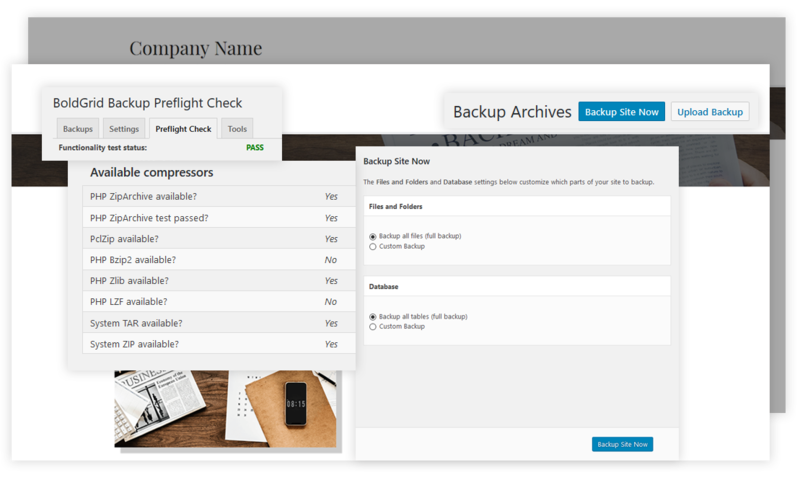 Select a number of backups to save in your WordPress dashboard to conserve server space. Protect important backups by excluding them from retention settings. Download and upload backups using protected links, which makes transferring a website from one host to another a much easier process. Not sure if you’re scheduling your backups based on your own time zone, your server’s timezone, the WordPress time, or UTC? BoldGrid Backup takes care of all the time conversions for you. You can receive emails when backups are created, restored, or both.